Remember the old Hee Haw song Gloom, Despair, and Agony on Me? Gloom, despair and agony on me-e! Deep dark depression, excessive misery-y! If it weren't for bad luck I'd have no luck at all! Gloom, despair and agony on me-e-e! Well, I just feel that way sometimes! With all the problems last week, then this week my laptop died. I had to reformat the hard drive and I lost everything! EVERYTHING! That is just so depressing! I know I should have backed up stuff better, like files and pictures. But, you know, I always ended up putting it off for later. But, this time later never came! The good news is that my laptop still works, it's just empty of everything I had. At first I couldn't even get on the internet. I lost all my drivers for everything, so I had to download them onto a disk and then download them on my computer. That took a lot of time. I'm still finding programs I need to re-download like Tweet Deck and my Swagbucks Toolbar and all. I'm sure I'll still be remembering things a few weeks from now. I'm sad cause I had finally gotten caught up with reading y'alls blogs last weekend, and now I'm behind again. I'll have to try and get caught up again, I guess. One day I hope to be on top of things again. Wish me luck, lol! You're the 2nd person I've heard of who has recently had this happen, it's a total bummer. I also could be better at backing my computer up, it's just to easy to put it off. I'm so sorry that you lost everything on your computer!! Made me decide to do something to have a back-up for mine!!! Would hate to lose my stuff!! Oh Nancy, I am so sorry to hear that! I know how frustrating that is. I hope you have a great weekend!!!! 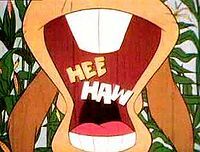 Ahhh....Hee Haw, I remember it well. I loved that show. Sorry about your files all lost, but atleast you didn't have to buy a new laptop. I back up once a month and I put all my pics on disk once a month, too. That reminds me, I need to back up the hubby's laptop. Awww... sorry to hear about your laptop, Nancy- I know how mad I was when mine died! what a bummer! i only back up my pictures once a year - and i should really do that more often. hope you get everything back to normal.